Sustainability: Meeting the needs of the present generation without compromising the ability of future generations to meet their own needs for health, prosperity and happiness. In 2011, Echter's replaced all of the T12 fluorescent fixtures in our store with new, high-efficient T8 lamps. This reduced our energy consumption by 30% for our store lighting. When we say our lighting is brighter, it has more than one meaning. We have replaced our single layer roof covering with double and triple-wall covers and reducing nighttime temperatures when possible saving over 40% of our winter fuel consumption. Most of our pots are made from recycled product. We can continue to recycle them We will take back the containers of every plant we sell. Bring the item back to us during store hours and place it in the recycle bin in the front of the nursery. Some of the items we can clean and use internally. Other items will recycled as much as possible. Echter's recycles our cardboard, plastic and paper whenever we can for the items we consume internally. Echter's offers earth-friendly options in the products we sell. We have the expertise to tell you what the safest products are and which ones are also effective. FoxFarm offers custom-blended soil mixes, natural and organic fertilizers as well as organic-based products Their fertilizers are built around the use of earthworm castings, nature’s finest soil amendment. They produce superior organic plant foods and extra-strength soil mixes. FoxFarm fertilizers are specially formulated to replenish the soil, lift the human spirit, and beautify the Earth, naturally. 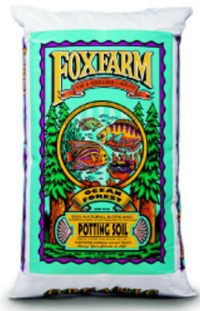 Fox Farm's Ocean Forest is the ultimate potting soil—everything your plants need, in one bag. It's a blend of earthworm castings, bat guano, and sea-going fish and crab meal. Composted forest humus, sandy loam, and sphagnum peat moss give Ocean Forest® its light, aerated texture. We encourage you to get into composting your yard waste. Our soils are typically low in organic material and benefit greatly from yearly additions of compost. We teach classes each year on composting. We sell compost bins and compost starter. In one year an average tree produces enough oxygen for a family of four, for one year. One tree will absorb the CO2 from 4 cars every year. To make up for the loss of trees in just the past decade, we would need to replant 321 million acres, which would entail planting approximately 14 billion trees every year - for 10 consecutive years. 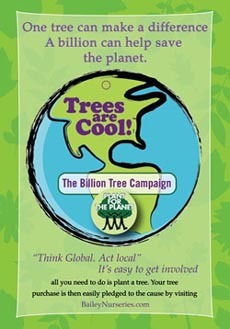 "Think Global, Act Local"- all you need to do is plant a tree. Shade trees can reduce your utility bills for air conditioning by 15-50%. The net cooling effect of a young, healthy trees is equivalent to 10 room-size air conditioners operating 20 hours a day.